Arthur A. Levine Books, 9780545870740, 256pp. The first middle-grade novel from Printz Honor-winning author Amy Sarig (A. S.) King! Obe Devlin has problems. His family's farmland has been taken over by developers. His best friend Tommy has abandoned him. And he keeps getting nosebleeds, because of that thing he doesn't like to talk about. So Obe hangs out at the nearby creek, in the last wild patch left, picking up trash and looking for animal tracks. One day, he sees a creature that looks kind of like a large dog. And as he watches it, he realizes it eats plastic. Only plastic. Water bottles, shopping bags... No one has seen a creature like this before. 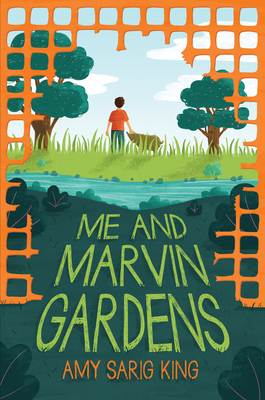 The animal--Marvin Gardens--becomes Obe's best friend and biggest secret. But to keep him safe from the developers and Tommy and his friends, Obe must make a decision that might change everything. Amy Sarig King has published many critically acclaimed young adult novels under the name A. S. King, including Please Ignore Vera Dietz, which was named a Michael L. Printz Honor Book, and Ask the Passengers, which won the Los Angeles Times Book Prize. After many years farming abroad, she now lives back in southeastern Pennsylvania, with her family. Visit her website at www.as-king.com and follow her on Twitter at @AS_King.